Tracking work, scent games etc. Dogs have a much larger nasal mucosa than humans, and a major part of the dogs brain is responsible for the interpretation and handling of olfactory information. 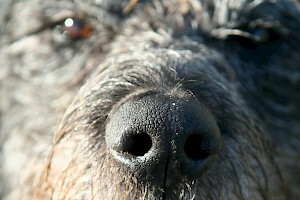 If you look for an appropriate activity, it is consequently sensible to challenge the dog’s nose. This kind of recreation is suitable for all dogs, small or large, slow or fast and even for dogs with joint problems. The result is a tired and balanced dog. Some people try to get the same result by exercising the dog more and more. This works seldom, in general the dogs just get fitter and more agitated. Tossing a ball for the dog to chase is a another popular recreation, but it mainly involves risks. A lot of dogs tent to become ball junkies. You should be careful not to toss the junkie’s ball from the balcony because he will probably jump to retrieve it. Tossing objects furthermore stimulates the reaction on movements and some day the dog might find it equally satisfactory to hunt dear and rabbits or even worse joggers, bikers or running children. Of course the dog enjoys chasing objects, as it is part of the natural hunting behavior. 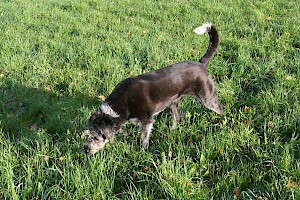 But using its nose to search for something or trailing is also part of it, but less dangerous for dog and environment. In this course the dog’s nose will be stimulated in different manners and at different places for examples with prey dummies or trailing. But there are much more possibilities to diversify this recreation course, as fun for dog and owner are the main goals.